On "Normal American Kids," the opener of Wilco&apos;s 10th studio LP, Jeff Tweedy delivers maybe his most straightforward lyrics ever. Over coffee-house strums and muted electric-guitar lines that swirl like an old movie flashback, the singer recalls being a teenage stoner with a chip on his shoulder, getting high "behind the garden shed" and "under the sheets in my bedroom," loathing the "normal" kids – but also fearing them and maybe, secretly, envying them. Misfits of all ages should relate, and the reflective sentiment brands a deceptively pastoral Wilco record, their most folk-rockingly introspective since 2007&apos;s Sky Blue Sky. It&apos;s a nice follow-up to last year&apos;s No Wave-y glam rush, Star Wars, a free surprise release that found them refreshingly noisy, energized and maybe a little bit defensive. (In some ways, it was their anti-"dad rock" record.) 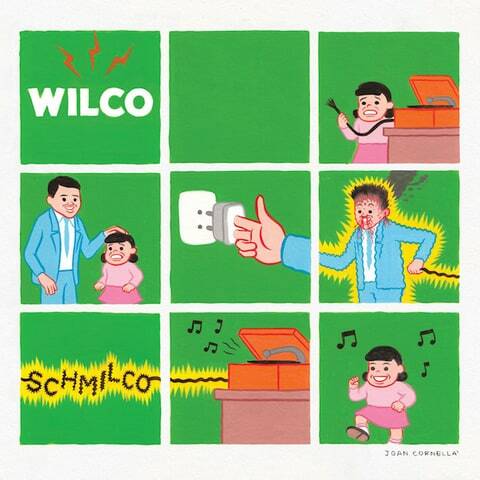 With a nod to Harry Nilsson&apos;s pop-eccentric touchstone Nilsson Schmilsson, Tweedy&apos;s mood is less self-conscious and more easygoing on Schmilco. His son Spencer plays drums on it, and it&apos;s also salted with nostalgic in-jokes. "Shrug and Destroy" puns off the title of a Stooges anthem while musically recalling White Album balladry. "We Aren&apos;t the World (Safety Girl)" invokes the superstar 1985 charity single, surveying a tough-guy candidate – Trump? Reagan? – and the singer&apos;s Armageddon fantasies while showing gratitude to a lover. "If I Ever Was a Child," all genteel guitar shimmer, and "Cry All Day," riding a brush-beat freight-train rhythm, both look back stoically through tears. Along with its return to bedrock sounds, the album seems especially shaped by the Midwestern-ness that&apos;s always defined the Chicago-based crew: their skepticism of fame, trend-mongering and empty rebellion; their Everyman work ethic and hometown pride – what some might describe as their "normalcy." All this is a plus when they nail a classic like "Normal American Kids," but can also make for music that occasionally verges on pleasant blandness. Wilco are at their best when they subvert their conservative impulses: See "Locator," with its loping bass line and guitar skronk, sounding like a matured sequel to the Pixies&apos; "Debaser." Or "Common Sense," a melodically and rhythmically woozy shout-out to that Middle American virtue, with marimbalike flourishes and insectile guitars rising like cicadas on a still summer night. "At the moment I&apos;m bored, buried," Tweedy intones, longing for "a burning bush or a button to push." His solution, of course, is making songs – songs that might even inspire a solution of your own.